PHILADELPHIA — All five Villanova starters scored in double figures and the No. 1 ranked Wildcats buried a record-matching 19 3-pointers en route to whipping Creighton 98-78 on Thursday night. Mikal Bridges scored 21 points with four assists and three rebounds and Jalen Brunson added 19 for Villanova (21-1, 8-1 Big East), who improved to 21-1 for the first time in program history and opened its four-game homestand with yet another victory. Donte DiVincenzo finished with 17 points, six rebounds, five assists and two steals, while Eric Paschall, who made the record-tying 3-pointers with just under two minutes remaining, ended with 11 points and a game-high eight rebounds for the Wildcats, who scored 16 points off turnovers. Marcus Foster scored 20 points to lead Creighton, which had its two-game winning streak snapped. Kaleb Joseph and Khyri Thomas each scored 12 points, while Toby Hegner and Ty-Shon Alexander ended with 10 each in the defeat for the Bluejays (17-6, 7-4 Big East), who have lost eight straight against Villanova and 17 of the 19 all-time meetings against the Wildcats. It was the eighth meeting against AP Top 25 teams this season for Creighton, which has defeated three of those Top 25 teams this term. However, the Bluejays have never beaten a No. 1 team in program history and are 0-3 against such opponents. As a team, Villanova shot 54 percent on 37 of 68 shooting and almost 50 percent from long range. The nation’s top-ranked team knocked down 10 3-pointers in the first half. Creighton shot 49 percent, but just 6 for 18 from 3-pointers. 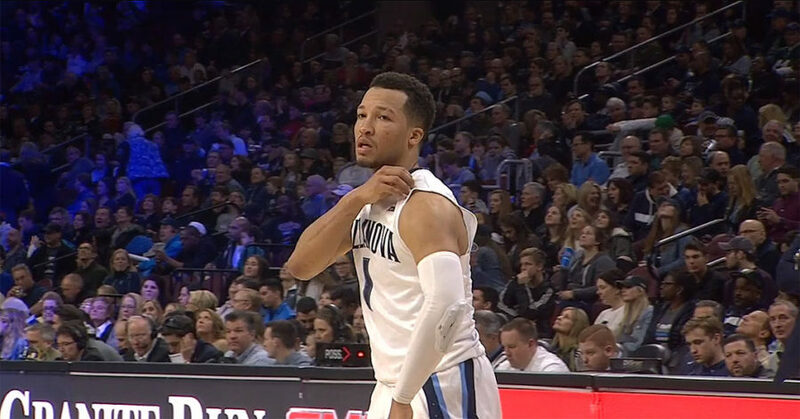 Villanova, which won eight straight, played its second game without injured leader Phil Booth. Booth is out indefinitely with a broken bone in his right hand, but it might be safe to say the Wildcats are easing toward winning their fifth successive regular-season Big East title. Villanova will share the Super Bowl schedule on Sunday in Philadelphia with the Eagles when they take on Seton Hall. Creighton makes its first trip to Wintrust Arena to play at DePaul next Wednesday.